New Spain consisted of Mexico, much of Central America, parts of the West Indies, from California to Florida, and the Philippines. Built by Catholic monks to convert the indigenous population, these spaces combined pre-Hispanic and European forms. Why are these murals in the cloister of Acolman painted in only black and white? The Conceptionists were founded for elite, pure-blooded Spanish women. This nun just took her vows. The beguiling—and tragic—story of the Carvajal family of crypto-Jews, is illuminated by the manuscripts Luis made. 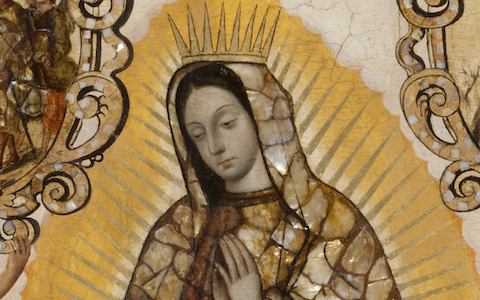 The original image of the Virgin of Guadalupe was miraculously produced—this mother-of-pearl version was man-made. A continuous narrative, this shows three different parts of the story, each in a different part of the landscape. The Spanish reused the stones of pagan temples to build their new capital atop the Aztec city, Tenochtitlan. This screen offers an idealized bird’s eye view of Mexico City on one side, and depicts the Conquest on the other. Cabrera fancied himself the Michelangelo of Mexico, but chose to borrow the format and iconography of Rubens. The convento atrium was a place for preaching. This cross taught new converts about Christianity. This remarkable object takes its subject from European prints, but was made by an indigenous artist. This multimedia architectural altarpiece took two decades to complete, and required teams of workers in many media.